The 1985 album Hounds of love by Kate Bush (image credit) is in my opinion the best album ever. The absolute highlight is the most bewildering part of the album: the B-side. 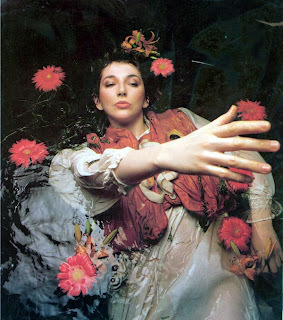 Although listed as seven separate songs (And dream of sheep, Under ice, Waking the witch, Watching you without me, Jig of life, Hello earth and The morning fog), Kate Bush herself baptized this uninterrupted combination of songs The ninth wave. Indeed, the songs belong together like one big composition, and the whole is even greater than each song individually. The music varies from semi-classical choruses to Irish jigs, with a helicopter borrowed from Pink Floyd thrown in for good measure. Kate Bush has never sounded so far out - and never so impressive. Unfortunately, it cannot be found on YouTube anymore (that's why the link goes to the Wiki page). Other songs by this act that would have qualified: The man with the child in his eyes, Don't give up (with Peter Gabriel), Cloudbusting, The fog, A coral room, Mother stands for comfort, Running up that hill.